The big challenge for the future is transforming and renewing brownfields to create new possibilities for modern cities. Our masterplan design can be recognized by a unique connection of public open spaces that facilitate, by good practices, social, civic, and economic interactions. LAND Italia, LAND Germany and LAND Suisse collaborate with communities, public administrations and companies with the aim of creating lively and sustainable cities. The competition has been launched by the borough of Saint-Laurent and the Bureau du Design de la Ville de Montréal to enhance biodiversity on its territory. LAND’s project Vert-de-Gris consists in a green, blue and social infrastructure that aims to reconnect people with nature. It is based on a multi-disciplinary and multidimensional approach, as it takes into consideration both the neighborhood and the territorial scale. Today’s fragmentation of natural elements symbolizes the fragmentation of the human experience, now segregated into mono-functional sectors that are the consequence of a non-systemic conception of urban life. In order to increase biodiversity and make it durable, LAND has created new and heterogeneous conditions for the development of life. The first element we have focused on is at the basis of all different habitats: the soil. The heterogeneity of rhythm and the relationship between horizontal and vertical elements are at the same time research topics and operative design tools: it generates the masterplan design strategy, where the variety is introduced in today’s monotonous landscape - that hosts different habitats such as forest, fallow lands, wetland, and promotes the spread of a wide variety of life forms compatible with the human presence in a healthy urban environment. 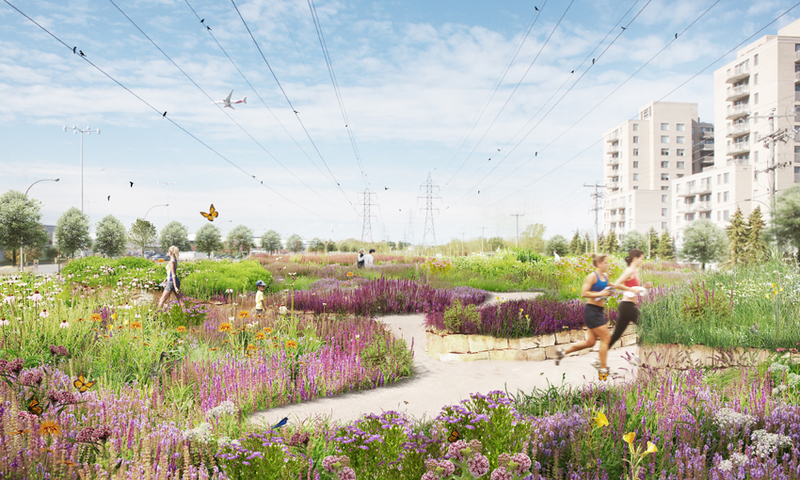 Looking towards the future, the Biodiversity Corridor is going to be an open-air laboratory, a living-lab for the construction of a new kind of Urban Nature. The Green Rays project defines and promotes a new slow mobility, that radiates like green arteries in Milan’s urban areas. Each of the eight green rays origins from a different area in town, stemming from the inner city and expanding outwards to the edge of the city where they merge into a circular green ring. This will be the future location for a possible bicycle and a walking path with a total length of 72 kilometers. The Green Rays project connects existing and new parks, including industrial areas reconverted by LAND, such as: Bicocca, Ex-Maserati, Ex Alfa Romeo, Ex area OM. The concept study “Green Ray Mönchengladbach" consists of a green connection at a landscape, spatial and visual level, that links the city of Mönchengladbach with the adjoining landscape area of the "Rheinische Revier" up to the mining area Garzweiler II. The architectural conception of a specifically localized green connection from the southern landscape to the Abteiberg Museum creates a concept for green networking in the city center and out of the city of Mönchengladbach. This creates new qualities of open space, which in turn can act as a catalyst for an integrated and sustainable urban development. Mönchengladbach borders in the south with the Garzweiler II open-cast mine on the largest lignite mining area in Europe. This landscape forms the largest contiguous green space potential space in the Rhine-Ruhr Metropolitan Region. Due to its size and location, the area offers enormous potential for the development of an entire region and the city of Mönchengladbach. The targeted activation of this area in the supra-regional, urban and local context can contribute to an increase in the quality of life through sustainable, ecological and future-oriented energetic measures. In Switzerland, agglomeration programs are gaining importance in spatial planning strategies. These promote urban and landscape development by integrating sectorial policies and single measures for spatial interventions. They represent a tool for local stakeholders to apply strategies and principles for a sustainable development and use of land. The construction of an interlinked system in-between urban centers and rural areas is a primary concern in defining the fundamentals of planning policies. At the same time urban sprawl has to be restrained in regards to the social, economic and environmental impact. Therefore a sustainable approach to spatial planning and development should include the use of existing developed areas and must focus on inward concentration of the built land rather than the Greenfield development. The PAL3 Agglomeration Program of Lugano, in its third generation, deals with the application of these principles to the region of Lugano. Over the last decades growing local and cross-border traffic and a fast-paced urban development have defined the open space, where the richness and the beauty of the natural elements face the contradictions of a densely populated urban area. The Arcipelago Verde model combines a strategy of preservation and territorial development. It offers new spaces to socialize, a new identity for the suburbs, the creation of public spaces interconnected by a “slow” network of paths together with the promotion and enhancement of urban and regional parks spread in the roman suburbs. The above are examples of features to be implemented throughout the green spaces along the Ring Road. These features are based on an archipelago of areas intended to shape the capital’s new great green belt. Arcipelago Verde is a new way of conceiving open spaces in Rome. It aims to join central areas in town with the existing parks, as well as enhancing the value of the “Agro Romano”, the greatest heritage of the Roman landscape. It is a large territory surrounding Rome with a surface of 212.000 hectares, mainly consisting of agricultural areas enriched with monuments, aqueducts, natural and archaeological sites. This is a diverse landscape that is currently disconnected from the city, however, could become the capital’s real innovation lab. Venetian cultural and environmental heritage coexisted for years with one of the largest industrial areas in Europe, Porto Marghera. Now the industrial district is mostly unused and seeks its own physical and functional changeover. This changeover aims at the overall re-launch of the industrial area through the introduction of new environmentally sustainable initiatives in all of the metropolitan areas. The paradigm at the base of this urban and environmental renewal project is to try to imagine the metropolitan area as a tree. A tree that has its roots in the historical city of Venice and its leaves on land in the midst of places of production and innovation. This is the start for the “Green Tree Strategy” for Porto Marghera: a new image for the metropolitan area that aims at enhancing the mainland, creating new polarities and multiplying places which act as generators of relations. The concept of ‘Fluid Landscape’ has shaped the project resulting into three green fingers that depart from the riverbank and lead into the core of the new urban development. They provide a strong dialogue between the landscape and the river and through the open spaces and the urban layout. The development is divided into zones with different characteristics according to the adaptation to local topography. The extended flood area between the water and the curvy riverside path creates natural room for the river Moskva to flow smoothly into a wider riverbed of high ecological value. 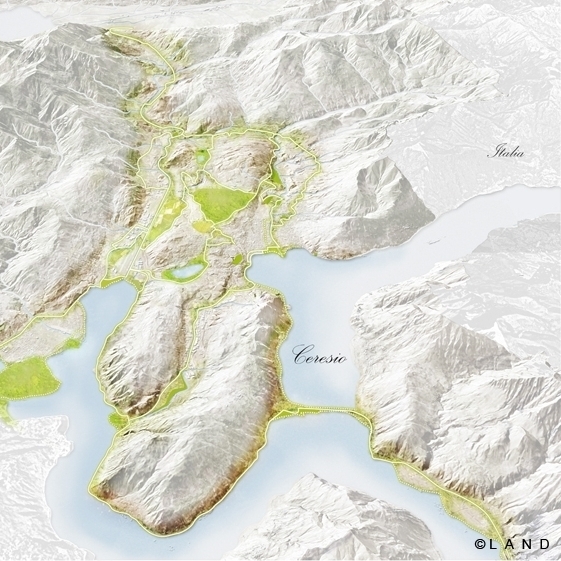 The main goal of the project Costermano sul Garda Environmental Excellence is the definition of a strategy that seeks to protect the landscape and to qualify the open spaces of the municipal area in order to increase experiential tourism, juxtaposing the traditional hotel model with new models where the contact with nature is valorized. After analyzing the landscape components at a municipal scale, especially the environmental and functional peculiarities of the territory in relation to the vegetation and the infrastructural system, the main areas of intervention have been chosen. All these parks are connected by a cycling and pedestrian route that aims to allow a permeability to the most interesting landscapes of the area. Landscape design starts from the assumption that design development must strengthen the relationship between the physical form of the place and its social, economical and cultural context. Facing the project with this point of view not only means giving space to the functions which have to be performed and to the physical regeneration of the area but it also means paying continuous attention to the peculiarities of the landscape which have to be protected and valorized, to integrate the project into the complex interlacing of the natural and cultural elements, enhancing their identity and actively protecting their integrity over time. Bardolino Route has its origins in the belief of six municipalities (Affi, Bardolino, Cavaion Veronese, Costermano sul Garda, Garda, Rivoli Veronese) that wants to connect and valorize the historical, cultural and economical heritage located in the area of intervention. The project outlines a new scenario, whose main frame is represented by a dense network of existing pedestrian routes, starting from the city center to the direction preferred by the user. These routes connect the Bardolino DOC wineries located in the territory, offering the opportunity for those who choose to experience a walking tour of the landscape of Lake Garda to taste its typical products. The project is structured as a tool to spread the knowledge of the places in the hinterland and to improve the hospitality management in a territory characterized by great landscape qualities and important wine production. A way to promote active landscape protection that can contribute in a sustainable way to the socio-economical development of the territory. The greenfield in the Mülheim planning area represents an important part in the urban space-planning model of the city of Cologne. The location of the district is close to existing structures (such as the Rheinpark) and has a great potential to redefine the quality of the existing location. It offers an opportunity to put a new emphasis within the open spaces and connects the district in a comprehensive way. Strengthening the green elements to the right of the river is a valuable contribution to the 'green city'. It takes on aspects of climate change, health, social issues, investment, soil protection, water and air as well as the preservation of biodiversity, thus future proofing urban life. The foundation of the design concept of the district provides a new added value from culture and nature. A stable network emerges through the historical, spatial and functional overlay, upgrading the existing structures according to location and equally enabling them to assume new perspectives. The new Rheinboulevard stretches along the Mülheim harbor resembling a green backbone. Nine green corridors originate here, arranged like teeth on a green comb. Kodrina Green iDensity is a new sustainable city model. It combines the local roots of the complex city of Prishtina and its great historical value as well as its beautiful surrounding landscape. With a great variety of housing and green spaces, Green iDensity is a new way of living in a city while staying connected with nature. The aim of the project is the development of a feasibility study as the basis for the joint application of the cities of Herten, Recklinghausen, Herne and Castrop-Rauxel for a national garden show in 2020. The central theme of the National Garden Show Emscherland 2020 is the development of a "Blue-Green Belt" along the river Emscher and across four cities. The study conveys the importance of the newly created green infrastructure as an example of the Emscher Valley. It also supports a step-by-step development with the advancing Emscher conversion from its source to the estuary. The entire planning concept is based on a permanent upgrading of the urban and landscape areas along the river Emscher, as well as its links with surrounding districts and its connection to regional open space concepts and route systems. Furthermore, the study will present the long-term reconstruction of the Emscher system at the public National Garden Show Emscherland 2020. More projects: Aquileia IT, strategic plan and territorial valorisation; Cagliari IT, green spaces plan; Caorle (Venezia) IT Ca’ Corniani, strategic approach; Catania IT, San Berillo masterplan; Dormagen DK, Freizeit- und Naherholungskonzept Dormagen; Essen D, European Green Capital 2017 Begleitende Koordination Einzelprojekte; Frosinone IT, River Sacco valley strategic plan, Strategia di valorizzazione della Valle del Sacco; Genoa-Ventimiglia IT, cycle path; Krombach D, Landschaftsplanerische Studie Krombach; La Maddalena (Olbia) IT, landscape project; Lampedusa IT, strategic plan; Lugano CH, Circonvallazione Agno Bioggio Landscape consultation; Lugano CH, Ex FLP cycle path Concept Design; Milano-Lugano IT- CH, MI-LU strategic plan; Mönchengladbach D, Der Grüne Strahl von Mönchengladbach; Palmaria (La Spezia) IT, Sustainable Tourism Development; Reggio Emilia IT, valorization of the enza valley; Riccione IT, strategic redevelopment; Rimini IT, New Rimini conference center and redevelopment of the ausa park; Valsorda IT, urban-environmental redevelopment; Venice gateway IT; Vercelli IT, Enerscapes project Scenario.